This Fort Garry school within the Grandin School District No. 1024, named for lawyer, legislator, and Justice Ralph Maybank, was opened on 4 February 1957, with architect G. A. Libling presenting keys for the building to Grandin School Board Chair John Dallyn. Also present were Chief Inspector R. W. Lightly and Fort Garry Mayor R. D. Chase. The school was enlarged in 1959 as part of a Division-wide building program which saw four classrooms added to it. Further capacity was added on designs of the Winnipeg architectural firm of Ward and Macdonald. A nine-classroom expansion was opened officially on 22 October 1963 and, in 1965, it was increased by another four classrooms. 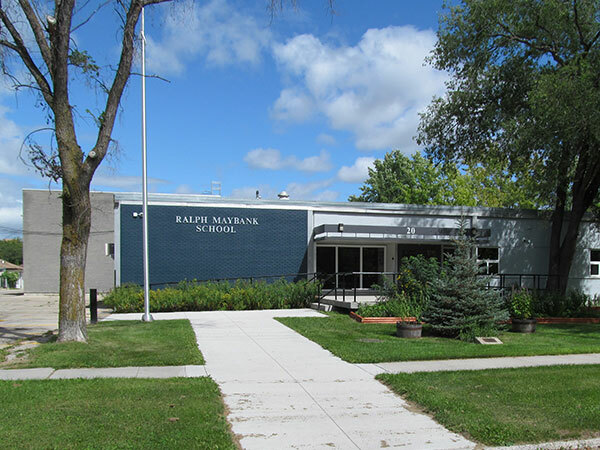 This school later received the elementary grades from Pembina Crest School. From around 1958 to 1964, the school was used on Sundays by the Westridge United Church, prior to the construction of their church on an adjacent site. For much of the early 20th century, the Pembina Trails School Division facility faced the possibility of closure on account of low enrollment. A time capsule in the school’s cornerstone was opened at its 50th anniversary celebration in 2007. Located in front of the school, a plaque and tree-planting were dedicated in 1999 to commemorate Fernand “Fern” Boissinot (c1935-1998), a 30-year employee of the Fort Garry School Division. Other teachers of Ralph Maybank School included Joan Eleanor deBeer Sommerville. “Maybank will be opened Monday night,” Winnipeg Free Press, 2 February 1957, page 2. “Rural Municipality of Fort Garry,” Winnipeg Free Press, 5 March 1959, page 6. “Vote on bigger schools but more pupils on way,” Winnipeg Free Press, 6 March 1959, page 12. “Tender addition to Ralph Maybank School,” Winnipeg Free Press, 21 December 1962, page 20. “The Westridge Community Centre,” Winnipeg Free Press, 16 January 1963, page 3. [Photo caption], Winnipeg Free Press, 7 September 1963, page 16. “School opening,” Winnipeg Free Press, 17 October 1963, page 9. “Tenders,” Winnipeg Free Press, 8 January 1965, page 42. “Centre holds annual meet on Tuesday,” Winnipeg Free Press, 7 June 1986, page 54. Obituary [Isabel Lindsay (1935-1994)], Winnipeg Free Press, 3 May 1994, page B6. “Schools plug into cable learning,” Winnipeg Free Press, 29 September 1995, page A5. Obituary [Fernand Boissinot], Winnipeg Free Press, 16 September 1998, page C7. “Low enrolment threatens school,” Winnipeg Free Press, 4 November 1999, page 10. “Declining enrolments,” Winnipeg Free Press, 6 December 1999, page A3. “Major school reorganization considered in Fort Garry,” Winnipeg Free Press, 27 April 2000, page A9. Obituary [Caroline Winnifred Calder (1900-2001)], Winnipeg Free Press, 24 January 2001, page C6. “Billboard [Ralph Maybank School],” Winnipeg Free Press, 1 March 2006, page B4. Obituary [Joan Eleanor Sommerville (1927-2008)], Winnipeg Free Press, 20 April 2008, page 32. Manitoba School Records Collection, Ralph Maybank School Daily Registers, GR10356, Archives of Manitoba. We thank Steven Christianson and Valerie Storjord for providing additional information used here.